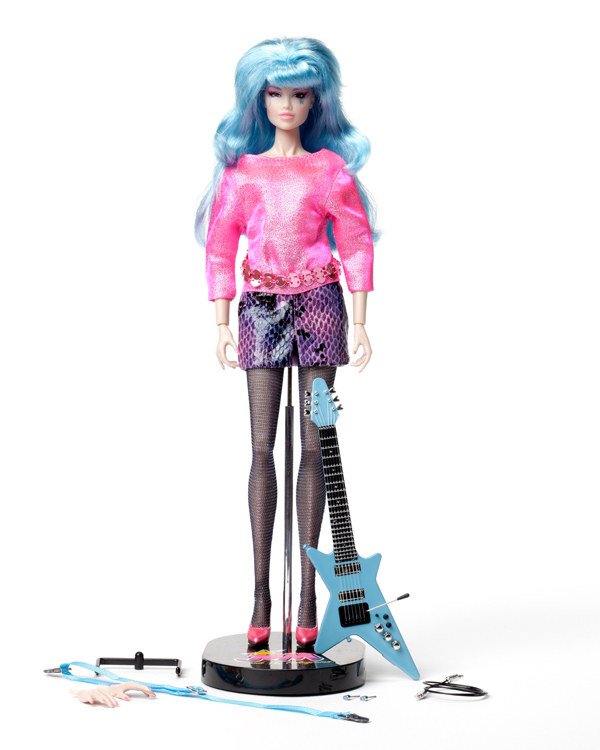 JEM and the Holograms Aja Leith 12"
2013 Collection. Jem and the Holograms. Limited Edition 1000. AJA LEITH was the Benton sisters' first foster sister. She's a levelheaded tomboy who enjoys sports, is good with tools, and speaks Chinese (she's Asian-American). AJA usually drives the Rockin' Roadster, too. She plays lead guitar in The Holograms! AJA LEITH is a fully articulated 12-inch vinyl doll with rooted hair and hand applied eyelashes. Ready to dazzle the audience and demonstrate the extent of her finely tuned guitar talents, AJA LEITH comes dressed in her truly outrageous stage costume and includes high-heeled pumps, her signature ultra-detailed electric guitar, complete with realistic miniature strings, whammy bar and plug-in amp cable! It also includes a doll stand and a certificate of authenticity. For adult collectors 14 and up only! Individual Package Dimensions: 15.5" Depth X 3.25" Width X 9.25" Height Weight: 2.5 lbs.